Curator’s note: This is the fifth and final blog post made by students in Dr. Perks’s spring 2015 Media Marathoning class at Nazareth College. Students conducted qualitative research projects in groups addressing one research question. These blog posts represent their distillation of findings that are also reported in 8-10 page essays. This post is from Brenna, Rachael, Sarah, and Selma. We explored the relationship between media and marathoning and the process of coping with the death of a loved one. Four participants where interviewed who all completed a media marathon after the loss of the person close to them. This video shown above discusses aspects of dealing with the loss of a loved one. While it does provide many recommendations, the main message is to deal with the loss in the best way each person sees fit for them individually. Each marathoners experienced loss in a different way yet, they all turned to a media marathon to assist in the coping process. 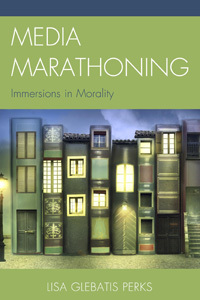 Whether the marathon medium was television, movies, or video games, all four of the participant turned to modern media as a coping mechanism. Based on the interviews, we concluded that that the marathoners were selective as to which genres they choose for their marathon. The medium chosen was used to allow them to escape from reality and experience a short-term relief of typical obligations. The narrative complexities of modern media allowed for this escape into these developed, intricate fictive worlds. The grieving marathoners believed the nature of the marathon allowed them to have a beneficial break from the struggle they were facing, and in conjunction with other coping mechanisms, it was beneficial. The marathon did provide them with short-term relief. The participants also all believed a time came to disconnect from the fictive worlds and enter into reality once again. The participants all advocated that a marathon should only be used for a short time period and the grieving audience must move on from their marathon and face the issues that must be dealt with.